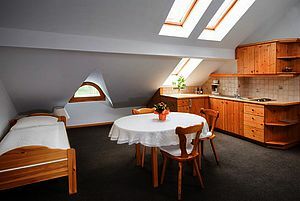 Our two family apartments are perfect for 2 to 5 person. Shower, WC, radio, Sat-TV, Wi-Fi, telephone and safe are also part of room equipment. 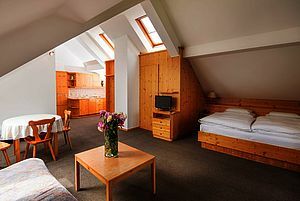 The rooms are spacious and have seperated area for sleeping and eating. Also a kitchen and frigde you will find in these rooms. One of the two apartments give a beautiful view over Vienna and the other one has two rooms. These accommodations are espacially suitable for families or for longer stays.